News has surfaced that this year’s Tour de France winner Alberto Contador failed a drug test. Small traces of a banned substance were found in the three-time Tour de France winner’s urine. Since Floyd Landis already tried the whiskey excuse back in 2006, Contador explains food contamination is to blame for failing. Contador tested positive on July 21, during the final stages of the tour and says he ate a bad steak. Clenbuterol is sometimes given to cows, pigs and other animals to increase their growth rate but has never shown up positive in a drug test. Contador beat second place rider Andy Schleck (Luxembourg) by 39 seconds. Next to Schleck, the next happiest guy is Lance Armstrong, who has stolen the cycling headlines (the few headlines that they have) for steroid allegations. 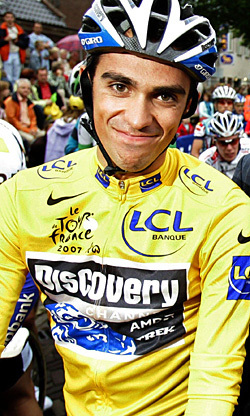 Congratulations to Alberto Contador who won the 2010 97th Tour de France. Contador edged out second place winner Andy Schleck by 39 seconds. The Spaniard becomes just the ninth rider to win three or more Tours. But Contador’s win did not come without controversy. Even up until yesterday, the Tour winner remained unknown after Schleck closed in on Contador’s lead by two seconds during Stage 19’s time trial. American favorite Lance Armstrong finished in a disappointing 23rd place. More pictures to come of the final stage of the Tour from thejerseychaser.com international correspondent Mallory Field!